If for some reason, Grammarly is causing some issues, you will need to uninstall it for now. And this article will show you how to uninstall Grammarly the easiest way. Just a few clicks and you should be done with the problem. So keep on reading and learn how to uninstall Grammarly from your device. This 501 Words tutorial will tackle all the ecosystems that Grammarly is available or installed. 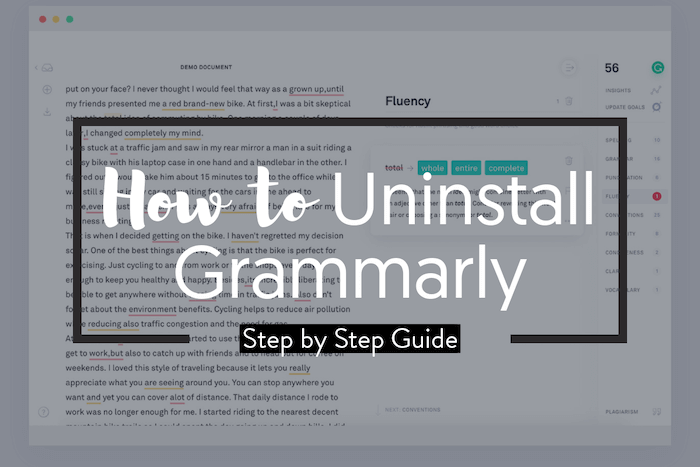 So no matter what your operating system or web browser is, you will find all the step-by-step guides here on how to uninstall Grammarly. You see there could be many reasons why you will need to uninstall Grammarly. It could be that you are not satisfied with its performance and does not help with your writing. If so, you must be using the free version. Check the review of Grammarly 2019 and try it. It’s super and way better than the free version. Or perhaps, it’s just having an issue with another existing software on your operating system. If so, you should recall the most recent app you installed or the one that got updated. Whatever the case may be, if you are really certain you want to uninstall Grammarly we will show you how. Whether you want it removed temporarily or permanently, this article is your guide. We will teach you how to do it the easy and quickest way possible. On your Google Chrome web browser, go to the green “G” icon on the top right corner of the page. Right-click on that green “G” icon to show the options. Click on the “Remove From Chrome” option. Another pop-up box will appear. Click on the “Remove” button to confirm the action. On the top right corner of the browser, click on the gear icon. From the drop-down menu, click on the “Preference” option. Click on the “Extensions” tab to see the installed Safari extensions you recently installed. Click on the Grammarly to see the options of actions that you can do. Uncheck the “Enable” box if you just want to disable Grammarly for the meantime. If you want to completely remove Grammarly, click on the “Uninstall” button instead. Confirm the action by click on the “Uninstall” button once again from the pop-up box. Do not forget to restart the Safari web browser for the actions to completely take effect. Launch the Mozilla Firefox web browser on your computer or laptop. On the top right corner of the web browser, click on the three-lined icon. On the drop-down list, click on the “Add-ons” option. On the next page, choose the “Extensions” tab. You should now see all the installed Firefox extensions on the page. Find the Grammarly extension and click the “Disable” button if you just want to disable it temporarily. Or choose the “Remove” button if you want it completely removed from Firefox. Go to the web browser’s menu. On the list, click on the “Extensions” button. On the Windows taskbar, point the mouse on the Windows button. Right-click on the Windows icon if you are using Windows 8 or later and click on the “Search” tab. If you are using Windows 7, just left-click on the Windows icon and use the “Search” bar. On the Search bar, type in “Control Panel” and hit Enter. Find the “Programs and Features” and click on it to see all the installed apps and software on your Windows system. Highlight the Grammarly and click on the “Uninstall” button at the top. This also works for Grammarly on Microsoft Office. Install the “App Cleaner and Uninstaller” using the link. Once installed on your Mac device, the app will automatically scan for any installed apps and their service files along with the extensions. Find the Grammarly from the list. Confirm the removal by clicking on the “Remove” button. We hope this has been of great help to you. If by any chance that you accidentally uninstalled Grammarly instead of just disabling it, you can always install it again from Grammarly site. Or get it through the extension page of your favorite web browser.